I remember the first time I had a big exhibition of my photographs. I was showing a portfolio about my family history. It was about the beauty and nostalgia of childhood - as well as the shadows. I'd worked on the series for about a year and a half. I photographed alone, edited alone, imagined and envisioned alone. I was in a little creative bubble - making work that meant the world to me, but not showing it to anyone. I used to go to the photo center where I worked every morning at 6am to work alone in the lab. I made print after print after print while listening to This American Life and watching the day lighten outside. There's a lot of solitary time on the creative path, and I spent 18 months alone with those images. In a way, I was listening to them - figuring out what they needed, and learning how to take them there. I put so much heart, soul, and effort into birthing that series. When the gallery opening finally rolled around, I was a bit of a stress case. I actually remember not wanting to go, if you can believe that. I had an unfortunate pimple on my chin and I'd spilled something on my sweater at the last minute. But I did go, of course...and it was such a profound experience to see my work on the walls. I was surrounded by family, friends, and kind people who didn't care about the ridiculous stain or the pimple. People were looking at the work deeply, talking about it, responding to my vision - and truly seeing me as an artist. I often think about threshold moments in life - those moments when we step into a new version of ourselves. That first big gallery opening was a threshold. After that night, I had the confidence to call myself an artist without fear that it sounded pretentious. I claimed it. I felt it in my bones. I made heartfelt images that filled me with joy, I shared the work with a beautiful, supportive community - and I stepped into a stronger version of myself. Making work is powerful stuff - sharing it is even more amazing. I would absolutely LOVE you to have an experience like this. 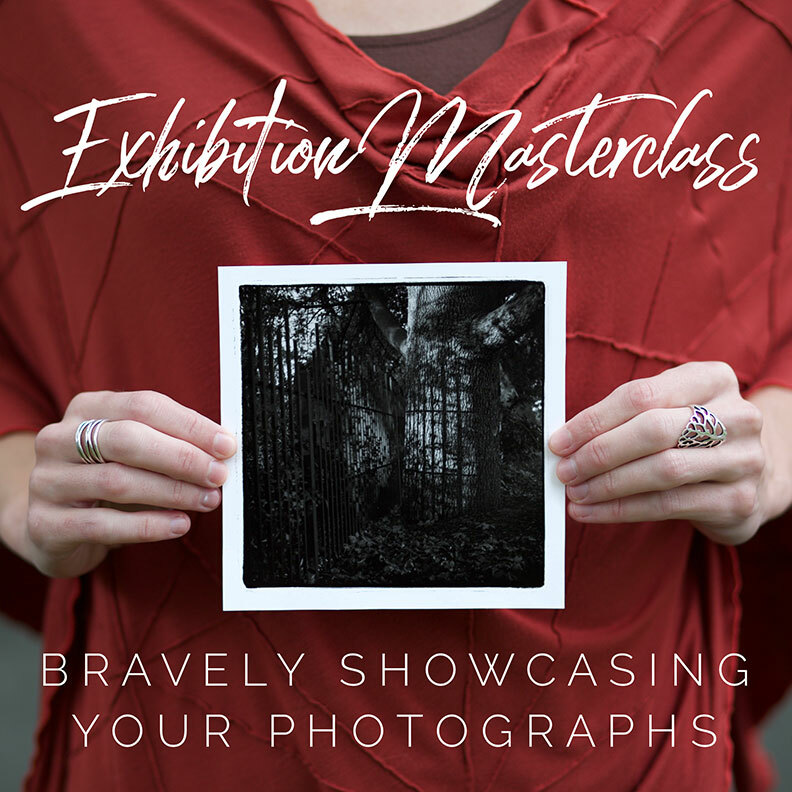 If you feel called to put your work on a larger stage, to connect with people who can move your work forward, and to fine-tune your skills so you're truly ready for wider exposure, I'd love you to join my new e-course, Exhibition Masterclass: Bravely Showcasing Your Photographs. I'm going to share everything I've learned from 20+ years as a photographer, curator, competition juror, and portfolio reviewer. I'm sharing it because I want to empower photographers to exhibit their work with excellence and confidence. If you're ready to take that next step, please join me. Learn more and sign up right HERE. All content copyright Laura Valenti 2019.